A new year has begun. And every new year brings predictions like: “This year, we’ll definitely see the breakthrough of (fill in the buzzword)”, or “This will be the year of (fill in another hype)”. And although it’s interesting to look at future developments: don’t be blinded by them. Miracles don’t happen overnight, certainly not technological miracles. CONTENTS: Foldable versus bendable | The Loch Ness monster | Design concept vs. reality | Why is this important? The start of the new year is always interesting for technology and gadget lovers: the CES show in Las Vegas (consumer electronics show). All major players and numerous startups show lots of new ideas to the public, lots of new products are previewed or launched. The companies mentioned didn’t launch a foldable phone, but we did see one: the ZTE Axon M. And this is probably not what you expected: it’s two displays attached to each other with a hinge, making it foldable. Which is something very different (and far more easy to develop) than the ‘bendable’ prototypes that were shown when talking about ‘foldable’ smartphones. This shows the foldable smartphone concept in action. When assessing new technological developments, looking back isn’t a bad idea. And, believe it or not, the first mention of the foldable/bendable Samsung smartphone dates already from 2011! That’s a long time ago… And it seems that the foldable/bendable smartphone is something like the Loch Ness monster: rumors about it surface from time to time. For that historical perspective: TechRadar has a good overview, starting with the 2011 prototype. Also interesting: once again multiple sources claim that we will see the foldable/bendable smartphone by the end of this year. But one source spoils the party and says it won’t happen this year. Here’s the issue: it’s rather easy to make a beautiful design concept, but translating that into a product that works and keeps working for a reasonable amount of time, is something different. One of my questions e.g. is how solid a bendable display will be, certainly if you can bend it all the way as shown in the concepts. 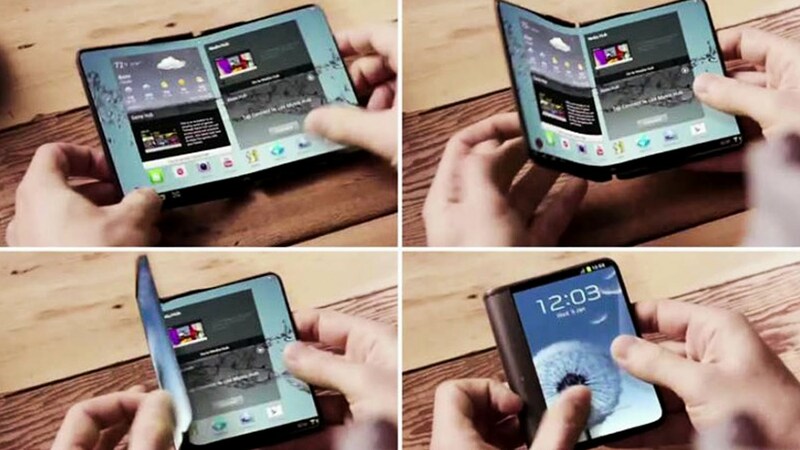 Over its lifetime, a bendable smartphone display will be bent thousands of times. What will that do to the display? Especially in the fold? And what if you dropped it on the bent part? 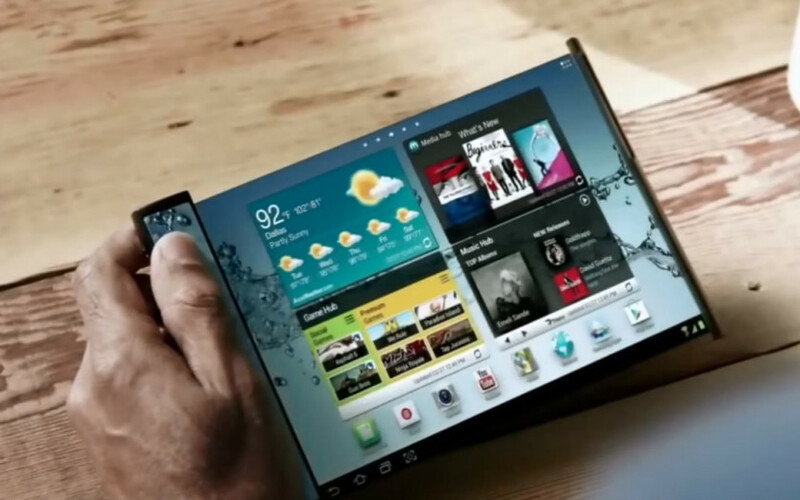 An even more exciting concept is the rollable tablet or smartphone. This article is not about foldable/bendable smartphones; it is about fantastic new technologies that claim to change everything, instantly. It is about the hard and long road from a design concept to a real-life product. One that is productive, at this very moment and next year, and the year after that. Also in the printing industry, we’ve seen design concepts that would revolutionize everything, but that are still not commercially available… Design concepts that got delayed over and over again, some got cancelled along the way. And that’s what this article is about: if you need to invest in production equipment, you need to buy something that works right now, at this very moment. PS: chances are quite high that we will see more hinge-based foldable smartphones this year. Over the past months, multiple patents describing these kinds of devices have been discovered. E.g., Microsoft has applied for multiple patents… But a bendable display, although concepts and prototypes have been shown (e.g., by Lenovo), that might take a while. And in case you want to know more about hypes, this article about the Hype Cycle and the Perfect Storm might be a good read! UPDATE 01/11/2018: the first foldable phone with a flexible display has arrived! It went on sale today, but only in China. 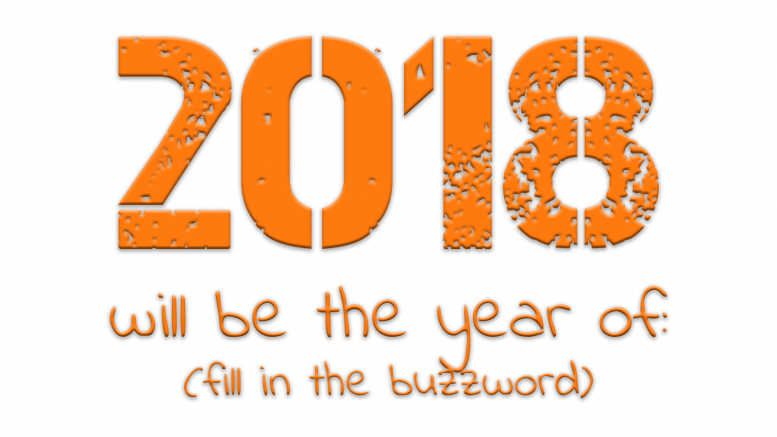 Be the first to comment on "This will be the year of (fill in the buzzword)"